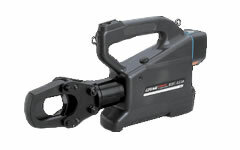 REC-S3550 Battery Operated Tools: Izumi Products. The REC-S3550 is designed to cut the toughest steel used in construction today. Portability and handling are made easier because the REC-S3550 is self-contained and compact. It features a new, larger handle opening with a rocker type advance/retract switch located on top of the handle for 1 fingered operation. Guillotine type cutting for less jamming than shear type cutting. 180 degree rotating head allows for easy cutting positions. Lock pin type cutter head. LED indicates when battery capacity becomes low. Well balanced and compact design. Built- in foot base with finger indents.